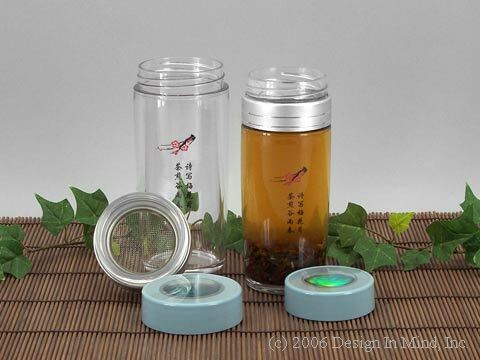 A fixture of everyday life in China, the drinking jar is a convenient, easy way to have fresh loose leaf tea on the go. Fill the jar with loose tea, add hot water, replace the strainer, cap it and go. Sip through the strainer as you please. When it's empty, just add more water. We recommend teas that can tolerate long infusion times and are good for multiple infusions. These include puerh teas, Fujian green and oolong teas, and Wuyi Mountain oolong. Other teas may work well also. Experiment! Glass Drinking Jar - 11 oz. 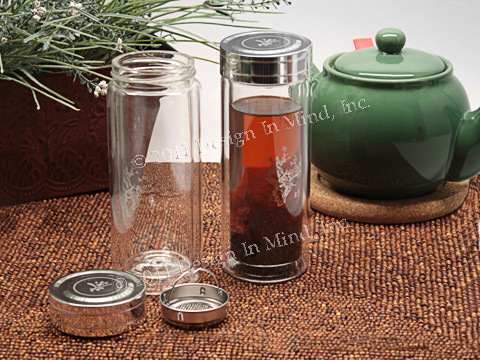 Double wall insulated glass drinking jar with removable infuser/filter and screw-on lid. Put loose leaf tea in jar. Add correct temperature water for your tea type. Set in infuser/filter. Steep for recommended time. Enjoy tea. Infuser/filter keeps tea in jar while drinking. Good for multiple infusions. Holds 11 ounces. 2.75 inch diameter, 7.25 inches high. Made in China. Polycarbonate drinking jars. Available in 8 and 12 oz. Set includes jar, screw-on strainer lid and screw-on travel lid. 8 oz. jar: 2.5 inch diameter, 6.5 inches high. 12 oz. jar: 2.75 inch diameter, 7.25 inches high. Put loose leaf tea in jar. Add correct temperature water for your tea type. Screw on strainer lid. Steep for recommended time. Enjoy tea. Strainer lid keeps tea in jar while drinking. Good for multiple infusions. Recommended teas are Bailin Gongfu and Fujian High Mtn Green.